The ultimate gym experience F45 has appointed the world-leading events company SoldOut to deliver the 2019 F45 Playoffs around Australia. 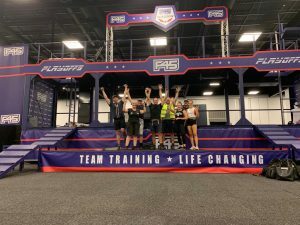 SoldOut were responsible for the complete make-over of the custom, 12-tonne F45 portable gym, and are also providing transport, logistics and event operations as well as signage for F45’s national and international offices and activations. “Our engagement with F45 involves a whole range of event services that highlight our expertise and capabilities in creative design, production and operations,” said SoldOut’s Managing Director Mr. Kim Voss. “Before we started transporting the F45 portable gym to the destinations around Australia where the Playoffs are being held, we completely stripped, refurbished and restored it to new. “Our team will continue to be on site setting up, packing down and supporting operations for each events on the F45 Playoffs schedule. “SoldOut has also produced brand new signage for F45’s offices in Australia, Los Angeles and London,” said Voss. The next F45 Playoff event will take place at Scarborough Beach, Perth WA 12-13 April 2019. For more details and the full F45 Playoffs schedule visit the F45 Training website.